It was a normal Thursday afternoon when Rue de la Loi, the main street that goes through the EU bubble, was suddenly filled with thousands of school students holding signs and shouting slogans denouncing global warming. They were cutting class for the climate. “If not now, when? If not us, who?” they wondered. The demonstration started in Brussels city centre, where they were supposed to remain. But they decided to march towards EU HQ in Schuman, where the decision-making really happens. The group soon managed to shut down one of the most notorious roads in Brussels for its traffic jams, forcing cars to turn off their engines. The symbolism could not have been clearer. 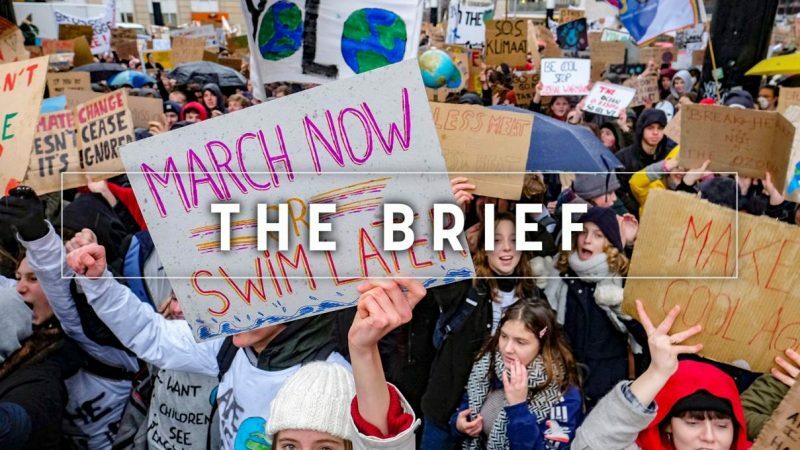 The protest was originally organised by two students in Antwerp who called on their classmates to join a climate march, inspired by young activist Greta Thunberg who protests every Friday in front of the Swedish parliament with the same goal. They were supposed to be 700. Around 3,000 showed up. The week after, they were more than 12,000. “Our future is drowning,” they warned, as astonished pedestrians walked by. As the EU elections approach, many citizens feel detached. Some citizens feel that their wishes, their needs, their very fears are not a priority for political representatives. And in the case of those under 18, they cannot even take part in the vote to express their view. However, the main challenges the EU is facing, and climate change is possibly the main one, will heavily impact their lives. British youngsters know that all too well. Many of those who were under 18 when the Brexit referendum took place, are now calling for a second vote so that they don’t lose the opportunity to study, work or simply travel across Europe. And as they will probably be voiceless in the polls next May too, these Belgian kids wanted to have a word and took the streets to state their claims. According to a recent survey conducted by Eurochild of 15,000 children from 23 countries, protecting the environment is one of the three priorities they consider the EU should have, but also equal treatment. Today’s young people grew up in heterogeneous societies. They feel more free to express their sexuality, gender, religious, political, ethnic and national identity. They live in a world without borders but they are literally seeing that world shrivel away and die. As they grew up, so did the far-right in Europe, by attacking the basis of the society in which they were born. They inherited that world and they want to keep it safe. They are the European leaders of the future. If the EU wants to have a chance, it might better start wondering how they can have their place in the debate. Even if they cannot vote. Emmanuel Macron may talk the talk on climate change but his country doesn’t walk it: France’s wind power sector has stalled, with not a single project approved since late 2017. Current EU energy chief Maroš Šefčovič will go on unpaid leave next month while he campaigns to be Slovakia’s next president. You can catch up with all the developments, machinations and rumours ahead of the EU elections, as well as national tidbits in our new live ticker. Stay tuned all the way up to May here! No deal or not, Brexit means that the Commission is set to revoke all .eu domain names belonging to British registrars, EURACTIV has learned. The EU executive has set a tight deadline for defining biofuel sustainability criteria, while France has gone a step further by ruling that palm oil is not a biofuel, so not eligible for tax breaks. An EU-US trade talk mandate is now out, but retaliation against car tariffs will come if Trump pulls the trigger. EU tariffs on Chinese electric bikes will come into force tomorrow. But other bits of EU law look a little more unkindly on the two-wheel machines. Italian MEP Cécile Kyenge told Gerardo Fortuna that she fears “institutional racism” in politics. She has been the victim of racist slurs from her political colleagues on more than one occasion. Check out the latest episode of Tweets of the Week and take advantage of the last chance to enter our caption contest! It involves Juncker and a man in an amazing hat. Send us your best entries here. The Davos World Economic Forum kicks off in earnest in the Swiss mountains. Our reporters Jorge Valero and Claire Stam will be there to provide all the latest news so stay tuned to the main website. I agree totally with these ‘children’. The adults of the world have abandoned the youth of today leaving them to the ravages of climate change and a very uncertain future. The lack of commitment to doing anything about it is glaringly obvious as politicians fight over stupid issues like Brexit while the planet is going to the dogs. These young people are displaying more commonsense and maturity than their adult counterparts – long may they continue and make progress.